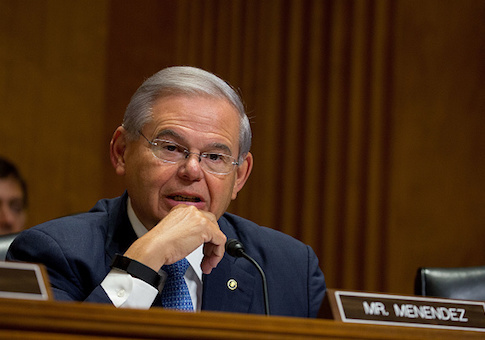 The federal judge overseeing Democratic Sen. Robert Menendez's (N.J.) corruption trial told the senator's lawyer to "shut up for a moment" on Wednesday. U.S. District Court Judge William H. Walls and lawyer Raymond Brown had been arguing just as the trial was beginning, Politico reports. Brown was at issue with a part of an opinion from Walls on Friday, where Walls dismissed the defense's request that the trial be temporarily put on hold so Menendez could participate in "critical" votes in the Senate. Walls wrote in the opinion, "The Court suspects that the trial strategy behind this motion, if granted, would be to impress the jurors with the public importance of the defendant Senator and his duties. No other plausible reason comes to mind." "Quite frankly, your honor, that language is extremely prejudicial to the defense and it comes form the court," Brown said. "I think the court has disparaged the defense." Brown and Walls began to talk over one another when the judge became fed up. "I said what I said" to "underscore what I considered the lack of merits in this motion," Walls added. Walls said he "didn’t disparage you." "Now I feel quasi-insulted. You tell me where I have ever speculated to affect the interest of a defendant before a jury," Walls said. "I want you to tell me where I have done something that reasonable jurors and lawyers would consider speculative and proactive." Menendez's attorney requested that the lines be struck from Walls’ opinion. Walls denied the request. "What your request lacks is relevance. There is no relevance to the issues in this case found in your subpoenas. And so consequently, they’re not only vague, but they’re without relevance, and therefore the motion to quash is granted," he said. This entry was posted in Politics and tagged Bob Menendez, Corruption. Bookmark the permalink.